I have to first put all my cards on the table. My default setting is one of cowardice and I have only ever felt one earthquake in my life, but I think people who are stubbornly staying in Christchurch need their heads read. I understand if you are stuck there by owning a property. The value has dropped and you have a mortgage you would need to service if you left on a property you were no longer in, but those people who are choosing to stay there, especially in the East need their heads read. The idea that your Cantabrian pride is keeping you in a situation where any moment a deadly quake may roll though your neighbourhood…again…seems just mental to me. I know what you’re thinking…”a deadly earthquake could happen anywhere at any time” or “you guys in Auckland live on volcanoes they could blow at any time”. these are actually true statements but if you take a place that has had 10,000 earthquakes in 18 months, or a place that hasn’t had a volcano go off in hundreds of years I think I’d feel safer. 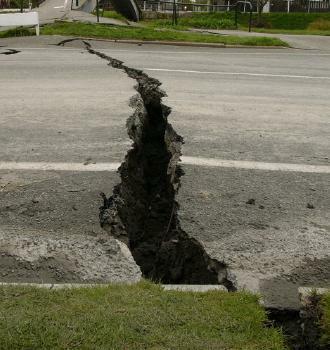 I guess I am saying that hindsight is 20/20 and it’s completely feasible that if another major quake came through Christchurch people would be saying, “Yes, you’re right, we should have left, we should have known.” For those, especially in the East what are you waiting for? I am seeing the quake maps now showing some of these aftershocks of over magnitude 5 happening out at sea. What about threats of tsunamis? As I read back over this I realise that what I have written may be taken as scaremongering, I guess that criticism is fair enough…I don’t want to ‘Ken Ring’ the people of Christchurch and actually put fear into your heads, I guess what I am trying to figure out is why you would stay other than being stuck there by owning a property. If you look 20 years down the track do you want to be the Cantabrian who swallowed his or her pride and ‘was beaten by the earthquakes’ and left? Or the one who arrogantly stayed where you were…and have a power pole fall on you after another quake. Would you rather be a cowardly grandparent in 20 years who ran away? Or a long dead 40 year old? I am sure I will get some critical feed back about this post, but it’s just me being honest and wondering why anyone would stay in quake ridden Christchurch if they had the ability to move out. I think you guys need your heads read. Previous Article General Debate: Free money – what would you do? In the main, I totally agree with you Pat, but in their defence, I saw a programme yesterday on the Travel Channel, must have been pretty old, about Christchurch, and I have to say, (never having been there) that it was a most beautiful City…….I imagine the people who dont want to leave, remember it as it was, and are hoping that one day it will be the same again. I think they are mistaken, and that it will never been the same…..It will be a modern city, in time, but I think it will be a very long time before they can rebuild it…who knows how long the earthquakes will carry on, who decides when it is safe to start re-building…..
After time, there might even be the decicion that it will never be safe and that the only way forward is to re-build somewhere else, and then what has all the waiting and sticking it out been for…??? It’s not like someone who has very little money can stroll into WINZ and ask for $1000 to relocate from Christchruch. If you don’t have the money, you’re stuck there. I was actually quite pissed off when I read this, but have calmed down a little but still need to add my comment. I am disappointed, because it’s you Pat, but not surprised that someone from Auckland would write this. Cantabrians are a close, caring and different kind of people than Aucklanders and only a Cantabrian can truly know the love and commitment we have to our beautiful city and there is NO WAY we will abandon it. We need to stay, to support each other and rebuild our wonderful city. Where else in this amazing country of ours is there a city surrounded by mountains to the west for skiing and beautiful beaches to the east all within an easy driving distance. We may be down but we are certainly NOT OUT! My faith in God to get us all through this is still as strong as ever. Hey Charmaine, I didn’t write this to offend, and to you and anybody else that is I’m sorry. I think that people saying that ‘Aucklanders don’t understand’ are they themselves also being a wee bit arrogant. The idea that someone will stay in a location, that is dangerous, because they love it seems unnatural to me. I love Fiji, been there many times, family has business there but when the coup started last time, and yes I was there, it was pertinent to leave as that was the smart thing to do for mine, and my families safety. Again I am sorry that you, and others were upset, I thought some would be, but I also think no one is talking about this part of the conversation…that for some…who can…it may be better to leave. Thanks for replying Pat, but here again is the problem. You didn’t offend me and I’m not arrogant, it is just so frustrating how so many really don’t understand our reason for staying in our beloved city. Comparing Christchurch to Fiji was unexpected! Fiji’s problems were political and man made, we are dealing with Mother Nature! To us leaving is not an option, Your comment that the city is dangerous is incorrect. Our home was virtually unscathed as was most of my families homes. We are lucky living on a side of town where the shaking is felt, but not a lot of damage occurs. This is the same for a huge part of Christchurch. Sure some older buildings around our area are damaged, but it is not dangerous. There are really no more buildings to fall down and the remaining ones have now been safely reinforced, so therefore there is no reason for us to move. We will stay and help the many whose lives have been changed and need to relocate. We will help them through our love, compassion and faith. If you are an aucklander then you have no idea what it is to be a cantabrian. I was born and bred here. Have now returned to Christchurch after many years away. You may ask why and say I need my head read. I will tell you why. This is the place where my brothers, parents and grandparents are buried. Christchurch is my Turangawaewae and I am proud to call it that, not that I have any Maori blood in me but my history and that of my forbears is in Christchurch. One set of Grandparents arrived on the 5th ship to enter Lyttelton.. They must have seen the enormous task confronting them when they walked over the bridal track. Did they run back to the shelter of the ship? No. They had what is called tenacity and fortitude. Something that obviously you do not know the meaning of. Think again about why people have chosen to stay here Come down and talk to us , you may actually learn something. Thank you for your comments Robin. I was moved to tears. My family are also all buried here and my great grandmother was on the 5th ship to arrived in Lyttelton as well. I can not and will not abandon them. I grew up here, moved away for awhile but my heart is here and I came back. This is my home and no number of earthquakes will change that. I agree with you that perhaps if Pat came to Christchurch and actually spoke to some of us, he would see the passion and love we have for our broken city. My confusion comes from talking with people, since the quakes started almost 18 months ago, in fact I was on air when the first quake hit and spoke with many, many Cantabrians since that has happened. Again, as I said to Charmaine, I mean no offence, but that doesn’t quell my confusion that some, those that can leave, still choose to stay. Really, you’re a business owner, a visionary and an all round humble guy, you seem like you’re rather ignorant in your capacity as any of these things. Ever heard the saying home is where the heart is…what about home is where your job is, your family, your friends, your home, your mortgage, your business, your life..forgive me, I don’t have a shift key so my punctuation and lack of question marks will be evident. You talk like we lack an iq, a sense of intelligence that you, the humble guy and rest of the country hold; you forget we live in not just a city but a community or a series of communities and we feed off it like the food chain. It’s not as simple as up and leaving, we have jobs, commitments, communities which not only need us, we need them. Moving 400 THOUSAND people isn’t as easy as you seem to think. To move is to move individuals away from families and to relocate lives…by finding jobs, homes at a minimum, we’re at the mercy of our banks, our employers and our family ties, our communities, our hopes, our dreams and what makes us happy. Clearly we have choices but they all involve sacrifice…you talk like bankruptcy is the easy choice but I don’t see you chucking your life savings our way, just your criticism to get a few readers. I haven’t once feared my life but I mourn it. I have a home which is standing proudly, it comes with a mortgage, my husband has a job, he is one of the lucky ones. I have an extended family in Christchurch, a very sick father, nieces, a mother, a sister, a former brother in law and a million memories. I don’t get to say hey, 400,000 people, come with me, so I don’t get to keep my life the way I want. So we chose to rebuild, we chose to have hope and we chose to ignore the ignorance of you and others who think we endanger our children’s lives each time we take them home. We don’t. The threat you percieve is far greater than exists. Personally I’d like to move away from the next 15 years of roadworks and rebuild, but my family, my husband’s job, my life’s milk stay in Christchurch so frankly I find you offensive. And ignorant. And not just oversimplifying my situation but over simplifying life. You’re a business owner…is your business easy to move. You’re an entrepreneur…in the face of what…you’re a visionary….really…you’re humble….I think not. We believe in Christchurch because to not believe is to sacrifice far more than we have already lost and because quite frankly, we understand the depths of our lives run far deeper than a few generalised, ignorant statements uttered to get people reading our prose. Seriously. Hey Amanda, firstly the ‘humble’ part of the ‘about’ is a joke…sorry you missed that. To answer some of your questions, yes I could up and move my business, but then I would be in the minority of business owners, it’s pretty much all based on the internet and phone. I just also wanted to say that you may have missed something on the post, not that I am trying to convince you, or quell your wrath, after what you’ve been through in Chch you are more than entitled to it, but the point I was making is that ‘some’ could leave Chch, in fact what I stated that those with mortgages wouldn’t be leaving. I was saying that those that could, that those that had no ‘ties’, who were free to leave, why are all they staying? That’s all. I see from your post, which I appreciate, that wouldn’t include you and your husband. Totally agree with Pats thoughts on this. Financially, the cost that these ongoing earthquakes will have on the country will be phenomenal and not just affects Christchurch. Absolutely feel for those that want to leave but can’t. For those that want to stay and are in relatively safe areas, i think its understandable. For those who are just plain stubborn to leave i think they are insane. If Aucklands volcanoes erupted tomorrow, my family and i would be on the next plane out of here. cannot understand how a pwerson can live in a city waiting for the next volcanoes/s and wondering if they might be the next to enjoy quakes? I hear the claim that the safest city in NZ to live is Hamilton, good luck with that one. I agree with you Pat. There is absolutely no way I’d be staying in Christchurch with my son. I’m more committed to his safety than any city. I understand that nowhere is safe, but living in a city that is still having earthquakes, especially after fatalities, I would be out of there! I don’t think you’re an arrogant Aucklander, Pat. I know from the outside we must look somewhat crazy! To be honest, I often question myself why I am staying, especially after the more decent shakes. The answer I often come back to is feeling safe, despite the many aftershocks. My house and place of work are built on good soil. The aftershock pattern is not unexpected, experts had warned us following September 4 that the land could take years to settle down. Out undersea faults are not lying in subduction zone meaning they will not generate a tsunami. That, and I’m handling the seismic events rather well. They haven’t rattle my nerves as much, and I’m living on the edge of the eastern suburbs in an areas that was lucky to escape the liquefaction after February’s big shake. for me, it doesn’t seem like it’s some kind of quest to wait out mother nature, or stubbornly prove my mettle by staying put. I just feel safe here, have a network of amazing friends who support each other and a stable job. The uncertainty of moving, finding a job, a place to stay, it’s not worth it, yet. You are clearly completely disconnected from your wider life – family, community and the reality of poverty and economics. People don’t stay from stubbornness. A minority are either stuck financially and wanting to leave, or have nowhere else to go because of all the ties here. Or, as most people are, they are adjusting to the mild inconvenience of the aftershocks and getting on with their life with a renewed sense of what is important in life – family, friends, community, lifestyle. Have your beaches taken away for a summer and you appreciate getting them back. Lose your library, pools, resturants, and you really appreciate them so much more. We have just returned from 7 years living in England to my hometown of Christchurch, shock horror, with our 3 year old. We don’t have a death wish, stubbornness or misplaced sense of Cantabrian pride – this is where all our family and friends are. The changes are enormous and on the whole a lot better. Everyone is so friendly – I’ve never met so many nice people in supermarkets and shops and just had a chat before. People are meeting their neighbours and establishing good friendships. We are in this together, and I wouldn’t blame anyone for leaving if it got too much, but I certainly wouldn’t blame anyone for staying. Just FYI I am not a ‘Jerk’ as you mentioned on FB, I asked a question…and people answered it. I’d hope people would be mature enough to disagree with me (and I knew as stated in the post that people would) whilst being grown-ups, hence me removing your last two lines of your reply. I don’t have a problem with that choice…to stay out of stubbornness…I just don’t understand it. I wonder if you asked any of those poor souls who dies in February, or their friends, or their families if they would rather those people had left…and still been here. Kindly remove my comments from your page. I think you are a jerk, a coward, and using the victims and the families of people who died to further your attention seeking is horrible. I will NOT be a part of this. Hey again Stephanie, I won’t remove the thoughts, I understand you now not wanting to be a part of the site, I respect that, but your contributions thus far are valuable and if you didn’t want them to be a part of it, you shouldn’t have posted them. Earthquakes here are now just a ongoing fact of life. Yes people died last February but now it is very unlikely there will be any more fatalities. More will die on avoidable road crashes than by fallen buildings, there are not any more in that state. Yes, there could be a major tsunami but that would need to be a massive quake on a new fault line (alps) but not on our present operative shakes. We do not like them, we tense up when a truck rumbles past our home, we looked around when a train went past a building we were in wondering were to go but overall we feel if it was going to fall it would have by now. The worse part to us is the condition of the roads, they are had it and would actually be our main reason to leave. We have our own home, family mainly in this area, grand children, all of which which we would have to leave to go, remember these can be felt in Timaru etc at times. We have a contracting business, to shift we would have to start from scratch building a customer base, in our early 60’s this is not really a desirable option and a mortgage to pay. So, like most other people, we may not like them but we just put up with them, remember the blitz, a lot left but life went on, even when the next wave of V1 rockets were fired. So no we are generally not stubborn, just resigned to the facts. I am sure Pat that you have heard the saying “before you criticize someone walk a mile in their shoes…………” There are many situations in life that challenge our thinking and in a sense I guess you were just thinking out loud (as broadcasters are inclined to do) but maybe you don’t need to understand why, but simply need to accept the reality that some do choose to stay despite the fact that from here in Auckland the solution seems to you to be quite simple. For those who found the solution that simple – they have already left – but for those who stay they need our prayers, our money, our positive thoughts not our negativity. You really did open a can of worms here my friend!.. Agree with the cantabs above, i have a daughter who is 8 and a baby on the way yes i have thought about leaving for there safety but when talking to my 8 year old about she says no mum i love Christchurch and my family i don’t want to leave. Like my daughter says mum its just the ground moving! I went to Australia January 2011 for a wee break and guess what hit by floods – stories i have heard of on the news families moving to get a new start – Rena hit the reef and there gear was damaged, they have moved and cant get new jobs. I work in Insurance and to be honest i want to stay to help the east suburbs not leave and abandon them, people respond so much better when they know you are here with them and not sitting in a office in Auckland but sitting in the heart of new city and doing everything you can to help each other. What you see on TV and hear on the radio is just the bad areas and the upset people calling – there are many but there a many that are not when we lose power here all my extended family jump to help. If i felt in danger i would leave but i dont – i could get hit by a bus tomorrow before dying by a Earthquake! And you need to be in this situation before you can make comments like your article this is just judging from the outside without any experience just like saying Fiji having the coup – i have been there too when there was a coup and yes on TV it looked scary but when you went there you didnt even notice it!….. just like most of Christchurch we still have our beautiful gardens and avenues and there rest is too come! Stay strong cantabs it will be worth it in the end. Comparing Christchurch to Fiji was interesting! Fiji’s problems were political and man made, we are dealing with Mother Nature! To us leaving is not an option, Your comment that the city is dangerous is incorrect. Our home was virtually unscathed as was most of my families homes. We are lucky living on a side of town where the shaking is felt, but not a lot of damage occurs. This is the same for a huge part of Christchurch. Sure some older buildings around our area are damaged, but it is not dangerous. There are really no more buildings to fall down and the remaining ones have now been safely reinforced, so therefore there is no reason for us to move. We will stay and help the many whose lives have been changed and need to relocate. We will help them through our love, compassion and faith. i can totally see why Stephanie got so frustrated. It is hard to be told ‘you need your head read’ which is hardly the kindest thing you can say to someone and then have to filter the comments you would like to say in return. I find this whole thread started from a point of contention, a lack of understanding and without any real purpose – certainly not uplifting or encouraging and ironically, in light of the Waitangi Day ‘one nation’ post, doing nothing to further that cause as an Aucklander raining down from on high onto Canterbury. Having lived in Japan for two years and having all my family in Christchurch, I am well used to having those I care about living through these natural disasters. Instead of shaking my head, I do what I can to support. Today I decided that my best course of action was to do what so many other people have done which is choose to not read any more of what Pat has to say. It occupied far too much of my mind all day yesterday and not in a good way. I know Pat personally from a few years back and so I also know that he likes to push the envelope and come from a point of controversy = play devils’ advocate if you will. He will probably justify his post as freedom of speech, right to an opinion and thought provoking conversation starter. All I see is someone fueling a fire of division, kicking the people of Christchurch when they are down and choosing to focus on the drama rather than the humanity of the situation. “Use your power for good” – that would be good advice, no? More than anything this just saddens me.